Today I’m going to show you a recipe I’m really proud of: king-size kimchi-filled dumplings, or kimchi-wangmandu in Korean. Mandu is the Korean word for dumplings, and recently I showed you how to make your own dumpling skins (mandu-pi in Korean). You can use them for this recipe. I showed you how to make them large, because we’re going to make king-size mandu today: big and substantial. Two or three king mandu should be enough for one meal. If you don’t make your own skins you can buy them in a Korean grocery store. 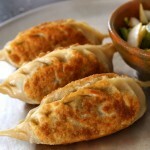 These mandu are made with fermented kimchi, so they have a serious savory kick, and I also use ground beef, ginger, garlic, and chopped onion, noodles, and tofu which make them full of flavor and juicy. Kimchi mandu are authentically Korean and really delicious, and I worked and reworked this recipe’s ratio and technique until I was fully satisfied with the end result. I ate a lot of mandu! But it was worth it in the end, because these are so good. I’m still eating them! What you need to do is make many of them at a time – 16 in this recipe – and freeze the leftovers for later use. Then they’re always on hand and you can have mandu any time you want. If you like this recipe, also check out my other mandu recipes: fluffy steamed pork buns (Jjinppang-mandu) and Korean dumplings (mandu), which don’t use kimchi. 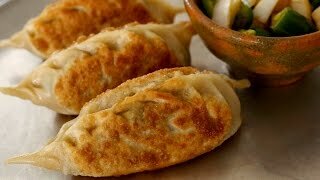 I hope you make some delicious mandu for your family and friends and have a lot of fun making and eating them. I guarantee everyone will love these, so be sure to make big batches of kimchi king mandu! Take your mandu wrappers out of the freezer. They can thaw out while we prepare the fillings. Place the beef, garlic, and ginger into a bowl. Use a wooden spoon to mix with 2 teaspoons soy sauce, 1 tablespoon sugar, 2 teaspoons sesame oil, and ½ ts ground black pepper. You can use a food processor if you want to. Heat up a skillet over medium high heat and add 1 teaspoon vegetable oil. Stir fry the meat mixture until the meat is no longer pink. Transfer to a large mixing bowl and be sure to include the juices from the cooked meat. Bring about 7 to 8 cups of water in a pot to a boil over medium high heat. Add the dangmyeon (aka sweet potato starch noodles) to the boiling water. Cover and cook for 7 to 8 minutes. Take a sample of the noodles to see if they’re cooked thoroughly. They should be soft with no firm bits in them at all. Strain and rinse under running cold water. Drain. Chop into small pieces. Add to the mixing bowl. 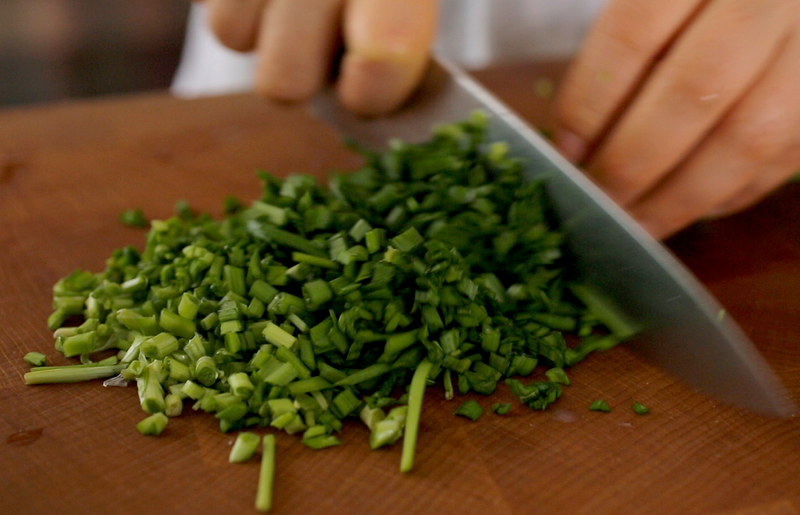 Add the minced onion, the chives, and kimchi to the mixing bowl. Squeeze the tofu slightly by hand to remove excess water and add it to the mixing bowl. Put a wrapper on your palm and add 2 or 3 spoons of filling to the center. Loosely fold it in half vertically. Pinch the bottom on the fold to seal it. Push the right side in a little bit, so the wrapper folds in on itself slightly. Pinch that fold to make a pleat. Do the same on the left side and alternate sides all the way up until the mandu is sealed. Pinch or wrap the end to seal it. Repeat until you’ve made mandu from all your fillings. Set the mandu on a tray lined with plastic wrap so they aren’t touching each other. Put into the freezer for 8 hours or so, until they are all frozen. Gently put them into a plastic bag or airtight container and put them back into the freezer. Boil water in a steamer. Line the steamer rack or basket with a parchment paper. Place some mandu in the steamer basket, but be sure to make room between the mandu because they will expand slightly when cooked. Cover and steam for 15 minutes. Remove and serve with dipping sauce. Heat up a non-stick pan over medium high heat. Add 2 tablespoons vegetable oil and swirl to spread the oil evenly. Add some mandu and cook over medium heat, rotating them so each side gets golden-brown. Lower the heat to low and cover. Cook for a few more minutes. Combine 2 tablespoons of soy sauce, 1 tablespoon of white vinegar, ¼ cup chunks of onion, 1 chopped green chili pepper (or jalapeño) in a bowl. Mix well. Optionally, if you like it sweet, add 1 teaspoon sugar. Posted on Tuesday, September 9th, 2014 at 6:01 pm. Last updated on May 27, 2016. Posted July 9th, 2018 at 8:52 pm | Log in to reply. Would like to check with your if the pork/beef did not pre-cooked. it could be keep at freezer for how long time? Need your advise, i have go thru alot comment but did not see anyone asking about this..
Posted November 12th, 2017 at 4:14 am | Log in to reply. It is a real pleasure to watch this video clips. There are some questions where i hope you can help. It will be appreciated. 4. Can we immediately steam or fry the dumpling from the freezer or do they need to be taken out to get it soften before cooking. Posted December 15th, 2017 at 9:08 pm | Log in to reply. 1. I just made a smaller version of the Kimchi Mandu using store-bought mandu (gyoza) skin.. if you are planning to make the skin yourself, based on my experience before, you can layer the skin on top of each other, but make sure you sprinkle some flour in between the layers so that they don’t stick to each other. 2. If you are going to use it for tomorrow party and if you are making fresh mandu, you would need to put the dumplings in a single layer , but you don’t have to freeze it. Just put it neatly on the non freezer fridge. 4. If you want to boil them, you don’t have to thaw them first. But just make sure that your water has boiled properly. However, if you want fried dumpling, i think it is better if you thaw them for a while, otherwise the skin would crack and the fillings will leak out. There is another method that i like to use. I would pan fry the mandu with little oil, then after the bottom part of mandu has browned, i would pour some water (be careful as the water may splash) and cover the pan. The mandu would be cooked by the steam from the water. Hope it helps, and happy cooking! Posted December 15th, 2017 at 9:10 pm | Log in to reply. Posted December 16th, 2017 at 9:58 pm | Log in to reply. Posted July 2nd, 2017 at 9:09 pm | Log in to reply. Thanks so much for sharing your cooking techniques online. I never prepared Korean food before learning from your Youtube videos, but for several months now, I prepare many of your recipes, mostly for breakfast. My favorite has to be pajeong, but I love making mandu also and doenjang jigae…well, on and on. Just tried the wangmandu this morning and we have several chilling in the freezer to enjoy later in the week. Quick story: About 18 years ago my 15 year old son and I were stopped over on a plane flight in Seoul for about 8 hours. We’d never been to Korea before and it was barely dawn, so we, and two friends, walked from the budget hotel where we were staying out into a small, partly residential , partly commercial, neighborhood, looking for a place to find an early breakfast. Everything was closed up and steel shutters pulled down in front of the businesses. There was a shop that had dried fish displayed in a window and as we stood there, a friendly man came up and asked us what we wanted. When we explained, he knocked on the door and an old woman opened the shop for us and prepared the fish in some broth cooked on a gas burner, and served us that with gim and rice and kimchi. It was my first ever Korean food. We left Korea that afternoon, continuing our flight. Over the years I used to think back on that experience and realize that although I’d spent some time cooking western food professionally, and lived in cities like San Francisco and eaten in some very nice places, that breakfast in Seoul was the best breakfast I had ever eaten. Finally, a few months ago, I decided to research Korean food and found you on Youtube. Your recipes have brought a lot of pleasure to me and my family. Below is this morning’s breakfast, if I can make the image work, on a very messy cutting board. Wangmandu, soft rice, gim, pickled garlic and steamed egg. Posted June 18th, 2017 at 6:51 am | Log in to reply. I made these for dinner tonight and they turned out great! I followed your recipe for mandu-pi, but mine turned out a lot smaller than yours. It’s really difficult to roll the dough in a perfect circle, but you make it look so easy! I might buy pre-made mandu-pi next time I make these. Thanks for the great recipe! Posted June 3rd, 2017 at 5:11 pm | Log in to reply. how to use freeze mandu?! Posted October 20th, 2016 at 9:28 am | Log in to reply. This was an amazing dinner last week. We saved some to take for simple lunches at work. Posted October 21st, 2016 at 8:09 am | Log in to reply. Yes, it looks amazing! Huge dumplings filled with all delicious stuff means generosity! You made great wangmandu! Posted August 21st, 2016 at 9:24 am | Log in to reply. how many grams in 1 pound of ground pork? 450g or 500g? Posted August 21st, 2016 at 11:41 am | Log in to reply. 1 pound pork is 453 grams. Posted November 4th, 2016 at 11:01 pm | Log in to reply. Posted June 19th, 2016 at 10:55 am | Log in to reply. Posted March 25th, 2016 at 7:22 am | Log in to reply. Thank you for excellent recipe. This recipe was originally posted on September 9, 2014 at 6:01 pm by Maangchi. It was last updated on May 27, 2016. The video was watched 2,184,723 times on YouTube & has 30,627 likes!